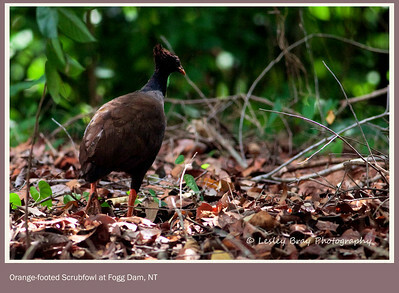 Orange-footed Scrubfowl & Australian Brush-turkey. 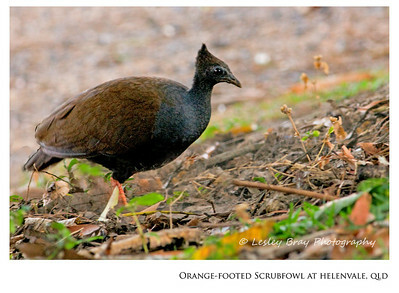 Orange-footed Scrubfowl, Megapodius reinwardt, at Lion's Den, Helenvale, near Cooktown, Cape York, Queensland, Australia. Photographed October 2013 - © 2013 Lesley Bray Photography - All Rights Reserved. Do not remove my signature from this image. Sharing only with credit please. Orange-footed Scrubfowl, Megapodius reinwardt, at Fogg Dam, Middle Point, Darwin, Northern Territory, Australia. Photographed December 2012 - © 2012 Lesley Bray Photography - All Rights Reserved Do not remove my signature from this image. Sharing only with credit please. 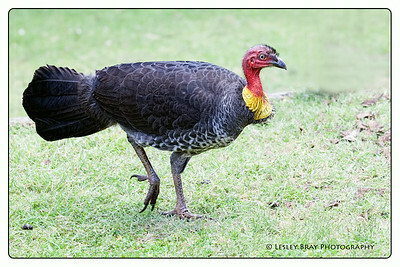 Male Australian Brush-turkey, Alectura lathami, race lathami, with bright yellow wattle at Lion's Den Camping Ground, Helenvale, near Cooktown, Cape York, Queensland, Australia. Photographed October 2013 - © 2013 Lesley Bray Photography - All Rights Reserved. Do not remove my signature from this image. Sharing only with credit please. 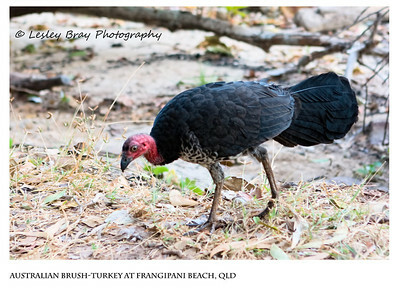 Australian Brush-turkey, Alectura lathami, race purpureicollis, pecking around our campsite at Frangipani Beach, Cape York Peninsula, Queensland, Australia. Photographed June 2010 - © 2010 Lesley Bray Photography - All Rights Reserved Do not remove my signature from this image. Sharing only with credit please. 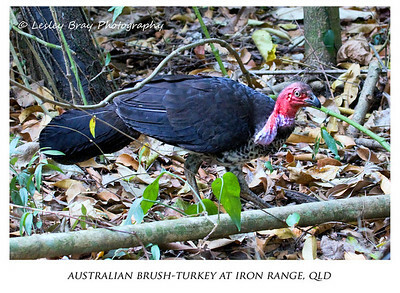 Male breeding Australian Brush-turkey, Alectura lathami, race purpureicollis, at Cook's Hut, Portland Roads, Iron Range, Kutini-Payamu National Park, Cape York, Queensland, Australia. The male's wattle becomes much larger during breeding season, often swinging from side to side as they run. The males' heads and wattles also become much brighter during the breeding and nesting season. Photographed October 2013 - © 2013 Lesley Bray Photography - All Rights Reserved Do not remove my signature from this image. Sharing only with credit please. 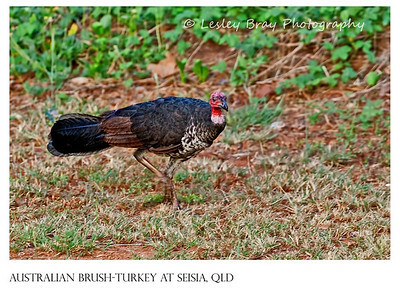 Australian Brush-turkey, Alectura lathami, race purpureicollis (purple wattle) seen at Seisia, Cape York, Queensland, Australia. Photographed May 2013 - © 2013 Lesley Bray Photography - All Rights Reserved Do not remove my signature from this image. Sharing only with credit please. 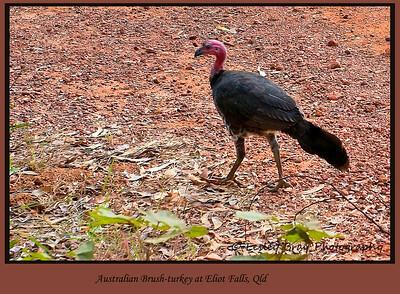 Australian Brush-turkey, Alectura lathami, at Eliot Falls Camping Ground, Telegraph Track, Cape York, Queensland, Australia. Photographed June 2010 - © 2010 Lesley Bray Photography - All Rights Reserved Do not remove my signature from this image. Sharing only with credit please. 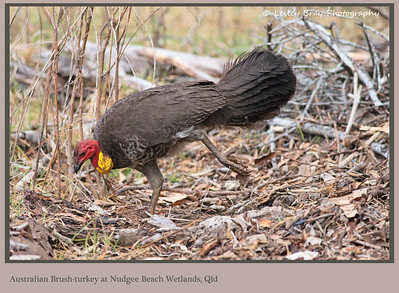 Australian Brush-turkey, Alectura lathami, race lathami (yellow wattle), busy at his nest at Nudgee Beach Wetlands, Brisbane, Queensland, Australia. Photographed January 2013 - © 2013 Lesley Bray Photography - All Rights Reserved Do not remove my signature from this image. Sharing only with credit please. 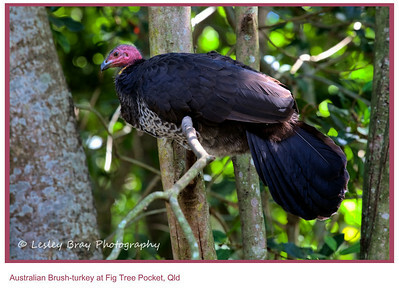 Australian Brush-turkey, Alectura lathami, race lathami (yellow wattle), high in a tree at Lone Pine Koala Sanctuary, Fig Tree Pocket, Brisbane, Queensland, Australia. Photographed April 2012 - © 2012 Lesley Bray Photography - All Rights Reserved Do not remove my signature from this image. Sharing only with credit please. 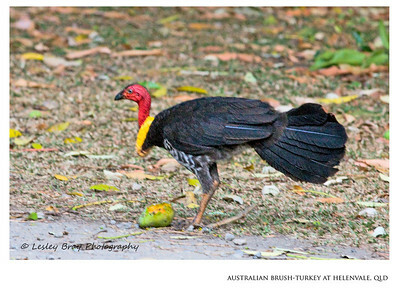 Australian Brush-turkey, Alectura lathami, at Bunya Mountains, Queensland, Australia. Photographed July 2014 - © 2014 Lesley Bray Photography - All Rights Reserved Do not remove my signature from this image. Sharing only with credit please. Orange-footed Scrubfowl, Megapodius reinwardt, at Fogg Dam, Middle Point, Darwin, Northern Territory, Australia.